Infogrames Melbourne House Pty Ltd. Publisher: Infogrames Melbourne House Pty Ltd.
SPY Fox™ is SPY Corp's top secret agent. Bad guys don't stand a chance against this clever fox and his stash of cool, high-tech spy gadgets! In Dry Cereal™, the world's dairy cows have been "cow-napped" by a villainous goat, forcing kids to eat their cereal without milk! 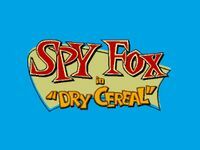 Team up with SPY Fox to use amazing gadgets like a laser toothbrush and x-ray chewing gum to crack the case! Plus, race spy vehicles through challenging courses to rack up big points and recover the stolen cheese in the FREE activity game – Cheese Chase! Use tons of cool, high-tech spy gadgets to help SPY Fox crack the case. Story and teaching level suitable for 7 to 8 year olds. Dialogues that stimulate vocabulary and the imagination. An exciting, hilarious adventure to develop your child's detective abilities. Random positioning of clues for hours of gameplay fun.